Just like in Star Wars, Harry Potter, and many other fantasy fables, we of the morally decrepit human race share a home world with a species far superior in spirit and integrity. I’m talking, of course, about dogs. Dogs are by no small measure the greatest living things on Earth, maintaining their well regarded can-do attitude even in the most trying of times. For certain proof of canine valor, look no further than this weekend’s premiere televised sporting event: the Puppy Bowl. The national broadcast showcases not only the athletic prowess and fortitude of the pooches on display, but the far more important quality of adorability. I was awarded the high privilege of spending an afternoon behind the scenes of the Puppy Bowl when Animal Planet shot the production in a New York studio back in October. Needless to say, the outing was sufficient in belly rubs and face licks. But the Puppy Bowl exists as far more than a showcase of canine cuteness; it’s also a means of getting the word out about puppy adoption, and a surefire means to landing every dog on the scene a loving home. If you’re a regular viewer of the Puppy Bowl, you know that the program sticks rigidly to the transmission of this message. Not only is the production urging people out in the audience to take a visit to their local shelters, but it’s also doing a bang-up job of finding homes for the pups it enlists to participate. Lucky me: I got a chance to meet a number of these dogs on set, and even to hold a few. Although in my eyes, nothing beats some up-close-and-personal time with a friendly pit bull mix, watching the pack hit the field was a pretty close bet. My vantage point of the soundstage afforded me a bird’s eye view of no shortage of impromptu wrestling matches and tugs of war, and even one dog’s ineffectual (but downright delightful) attempts to burrow into his oversized water dish. 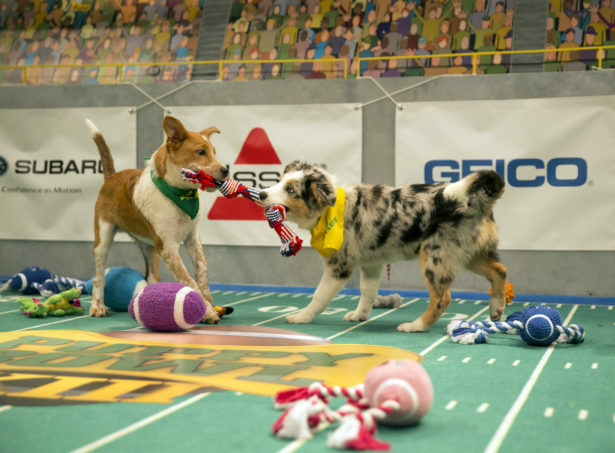 The Puppy Bowl airs at 3 p.m. ET/12 PT on Animal Planet. Michael Arbeiter is the East Coast Editor of Nerdist. Send Michael dog GIFs aplenty on Twitter @MichaelArbeiter.